Much like the latest line of X-Men movies, Guardians of the Galaxy seems to like to play with cultural artifacts of decades past, whether in media, wardrobe, or lingo. James Gunn, who directed the massively successful and entertaining Guardians of the Galaxy, littered the first movie with 1970s hits and he seems primed to dip further into 1970s hits with the second Awesome Mix Tape. He might even dip into the 1980s. Just don’t use The Cars’ “You Might Think.” CBS’ woefully canceled Brain Dead already used that track in a memorably inventive, funny way to convey the signs of an alien invasion. In that same vein, the first poster for Guardians of the Galaxy, Vol. 2 is potently reminiscent of the 1990s. The poster features our gang of heathens leaning against a wall in mock-pretentious poses, apathetically looking down or away at some random point, in a black-and-white image. This would seemingly be a parody of the famed Calvin Klein ads of the era where 90s teenagers and twenty-somethings talked a bunch of mumbled nonsense while standing against a wall in black-and-white. The tagline of “Obviously” also seems to point toward the believed lethargy of the time period. Though your eye will certainly be drawn to Michael Rooker, Chris Pratt, Zoe Saldana, and David Bautista, take a look at the bottom. Grappling onto Star Lord’s boot is none other than Vin Diesel-voiced Baby Groot, who does not look particularly jazzed about the mission. 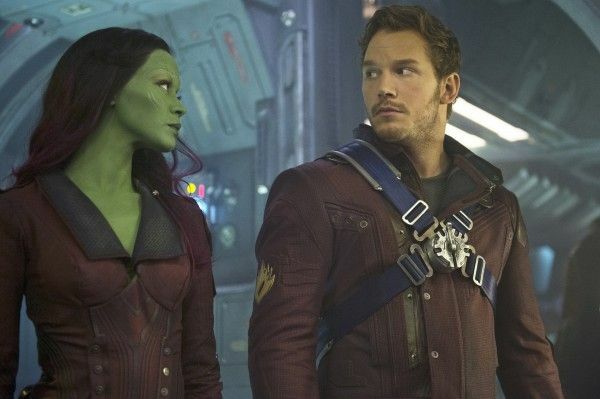 The Bradley Cooper-voiced Rocket is also in attendance, leaning up between Gamora and Yondu; Karen Gillan‘s Nebula can also be seen at the end of the line. It’s worth a smirk, but what everyone is really looking for is the first trailer for the movie, which will arrive in theaters and IMAX on May 5th, 2017. The trailer is on its way – it will likely premiere on a big November/December title in theaters – but for the time being, we can just gaze at the cuteness of Baby Groot cowering behind Star Lord for once. You can take a look at the poster right below.